The church is an early 19th century building of classic style and layout with an entrance vestibule, leading through two side doors into the body of the church. 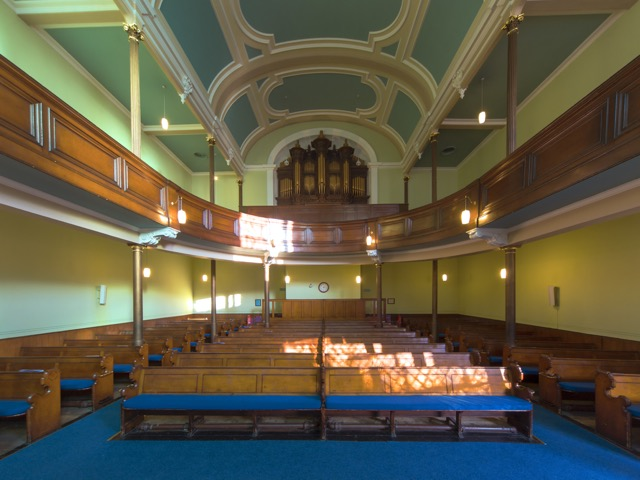 There are two aisles leading between seating on fixed pews to the front of the church where there is a raised platform occupying the full width of the building, but having a usable space of approximately 9.5m x 3.5m. This platform is accessed by two steps across the entire front width and is approximately 46cm higher than the floor of the church auditorium. The seating is not raked and will seat up to 200 people, although audiences of 30 to 40 also feel comfortable. The auditorium has excellent acoustics and generally there is no need for amplification of musical instruments. A sound amplification and assisted hearing system is available. Piano. On the platform of the church auditorium is a 190 cm Weinbach grand piano, which is tuned regularly during the year. The use of this instrument is free for those hiring the church but we divide the cost of tuning amongst those who use it. Lighting and power. The platform is lit separately from the church auditorium, by 8 domestic spotlights, arranged overhead, 4 at each side. There are also 4 double socket 13amp mains voltage power points, arranged as 2 at the back of the platform and 2 at the front; and one double socket 13amp power point with RCD cut out at the front of the platform.